In physics, angular momentum is "the quantity of rotation of a body, which is the product of its moment of inertia and its angular velocity", see Angular momentum. Since alpine skiing is mostly about turning, this is one of the most fundamental biomechanical principles. We create angular momentum by turning, by using our body (to counterrotate), we block the angular momentum with a Blocking pole plant, relying on its preservation etc. We often leverage the angular momentum of the upper body. Since it's a bigger mass than the lower body, we can create or control the angular momentum and leverage the upper body's angular momentum to control the lower body (turn or stop turning). The much higher mass of the upper body means it has a high angular momentum even when turning slowly and when we transfer/leverage this to the lower body, it will result in a higher speed of rotation. This is what makes even a feeble blocking pole plant very effective in certain situations. Examples of leverage include Counterrotation and Blocking pole plant. These are very related but rather different. Angular momentum may be created or controlled with coiling and leveraged for uncoiling++ but coiling itself is a muscular effort, a "winding" of the body, creating an internal "torque" or "tension". 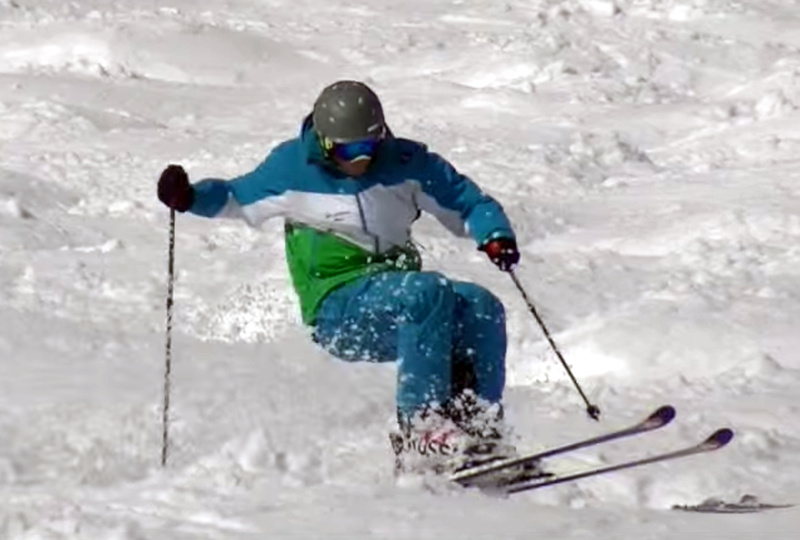 Angular momentum is a given in skiing, as we keep turning down the slope, so it is something to control and use. We generally need to be mindful of and control the angular momentum of the upper body throughout the turn, because if it gets too high, it will be harder to control and will cause serious effects down the line. 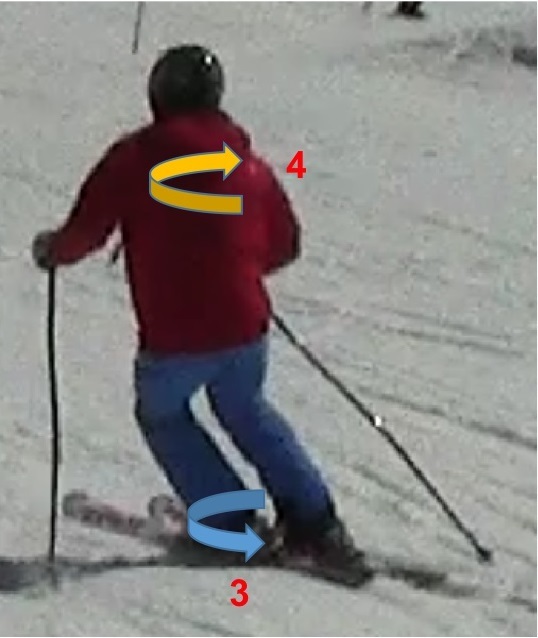 The issue with too much angular momentum of the upper body, as in the photo above is that it will need to be controlled and reversed eventually, if we are to ever continue with the next turn and that will cause us to release late, put pressure on the skis when we don't want to etc - as the only way to reverse the angular momentum is by leveraging the skis and snow, via the core and legs. The skier above, unable to decouple upper and lower body, will not be able to turn quickly and will spend most of the time out of balance. Controlling angular momentum and coiling. Skier: Ted L.
See Steering and coiling for a more detailed discussion of these relationships. Viewed 367 times ( | Print ) this page.